Vital Oxide is EPA registered hospital disinfectant cleaner, mold killer, and super effective odor eliminator. Vital Oxide eliminates odors completely on a molecular level, not covering them up with masking fragrance or nose burning chemicals. Effective on tobacco smoke, cooking odors, pet urine, sports equipment just to name a few problem odors. Vital Oxide is tough on mold, mildew and bacteria anywhere! Use Vital Oxide anywhere you have mold and mildew odors; shower stalls, under sinks, diaper pails or in basements and crawl spaces. The active ingredient in Vital Oxide is chlorine dioxide which sounds like chlorine, but it's not. Chlorine dioxide and chlorine are very different, react differently, and result in different by-products. Vital Oxide is safe for your family, pets and the environment and best of all has absolutely no chlorine smell. Vital Oxide comes ready-to-use. 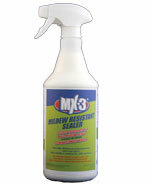 There is no mixing required - just spray right from the bottle. Vital Oxide is not irritating to the skin and not corrosive to treated articles. As a matter of fact, it is so gentle you could wash your hands in it.